Happy Monday, Friends! Hope you had a good weekend! I'm having a really good time playing with all my new Ippity Stamps. This card was made with the current sketch over at Card Positioning Systems. When I saw it, I immediately thought of the new Ippity set, A Moment in Time. How perfect are the patterned rectangles for this sketch! I used A Bit of Burlap for the Kraft paper. I stamped it quite a few times for the effect shown here. And the sentiment is from The Simple Things. Amazingly, there's no patterned paper on this card. Check out the Ippity Blog for all the participants of today's awesome blog hop! This is great, Ashley! Love how masculine it is and that it is all stamped! CAS and sharp! This is one great manly man card. I really love how you used this sketch. Love this Ashley! Great colors and striking patterns! Perfect guy card! Great use of those rectangle stamps! ooh!! very very nice card. You rocked this sketch. I also thought of the same stamp when I saw that sketch. Very nice. Wonderful card for a fellow.. Beautiful work! I am going to have to try this. Great way to use the images, Ashley! FABulous, love how you used the stamps! O I love it I wished I had rounded my squares.. BEAUTIFUL!! Ashley..this is one amazingly beautiful masculine card!!! Love it! Oh, I really love this!!! Oooh Ashley, I absolutely love this card! 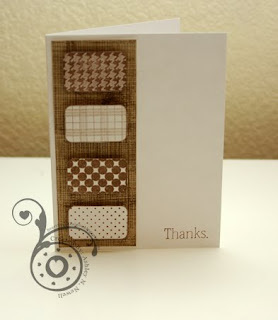 A great masculine card and love how you used that burlap stamp...love this! Hi Ashley. This card is GReat!!! I love the simplicity of it while being perfect for any male!! Great job! Love the clean and classic look of this! Perfect masculine card! Great job with CPS sketch 168! Such a fun of those patterned stamps! LOVE the masculinity of this! Hugs! This is fantastic! What a great use of stamps and a great looking card.